RAF cover produced by ourselves as the Official 1997 Goodwood Festival of Speed cover showing the Red Arrows Royal Air Force Aerobatic Display team performing the Opposition Role over the race course and a BRM 16 racing down the Goodwood circuit. 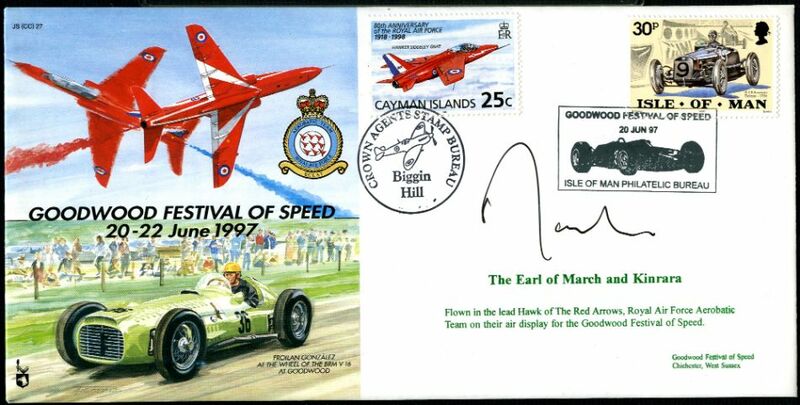 The covers have been flown by the Red Arrows and bear 30p Isle of Man racing car stamp cancelled with Isle of Man Goodwood Festival of Speed postmark. This cover is a little different in that the cover bears 25c Cayman Islands Hawker Siddeley Gnat 80th Anniversary of the Royal Air Force stamp cancelled with Crown Agents Stamp Bureau Biggin Hill cachet showing a Spitfire. 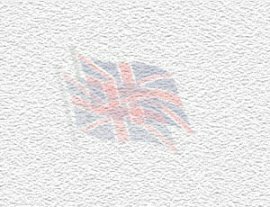 Postmark and cachet added at the 1998 Biggin Hill Air Show by the Crown Agents. The cover is signed by the owner of the Goodwood Estate the Earl of March, who is a keen motor enthusiast and organises the events at Goodwood. Official special numbered and certified on reverse.